From now until December 31, 2018, when you sign up as a Vanguard subscriber, not only do you get our Premium Morning Newsletter, but you register to win a free copy of “Davis Downtown” which is hanging in City Hall. Anyone who signs up between October 27 and December 31 is eligible (current subscribers can become eligible by increasing their monthly donation). 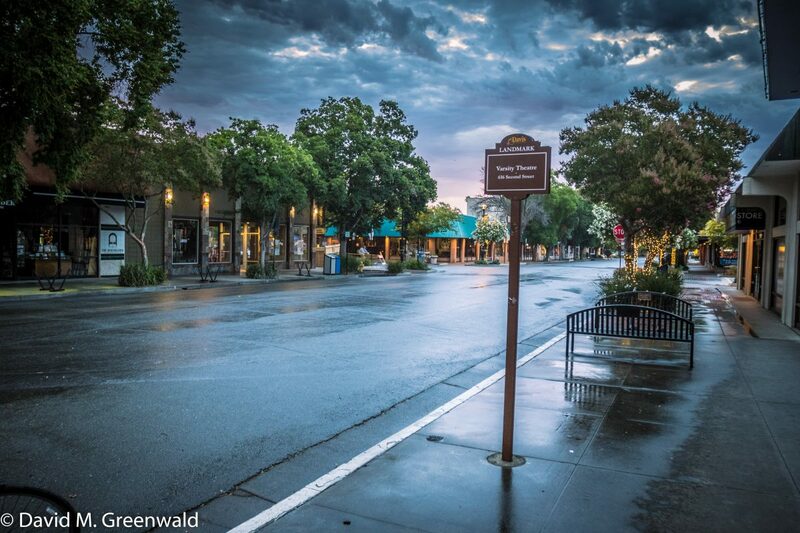 The photo was taken July 13 in the early morning hours right at sunrise after a brief freak shower in downtown Davis. A larger version of the photo was donated at the October 2 City Council meeting to the city of Davis and now hangs at City Hall. Since 2006, the Davis Vanguard’s mission is to provide communities in Yolo County with local news, commentary and coverage of the courts, as well as to participate in fostering community and civic engagement. Unlike mainstream publications and news providers, the Vanguard covers many important local news stories as well as national news that directly affects residents in our communities. The Davis Vanguard is a 501(c)(3) non-profit, so we need funding from donors to keep the organization up and running. For as little as $10 a month you can become a subscriber and receive our monthly newsletter with exclusive content. Please help us continue in getting the news that matters, to you. If you are already a subscriber – adding as little as $5 a month will qualify you as well. You can also purchase the photo in full color in the 18 by 12 format for $199 by going to: here. Larger sizes also available. I told you that was a great photo. It should be obvious to any sensitive and thoughtful viewer of this photo that one reason it is so lovely is because there are no motorized conveyances present. You should also notice that there’s no people present either. Funny how people and motorized conveyances word hand in hand.